"If once you have slept on an island, you'll never be quite the same..." Amid the shimmering waters of Washington Sound, between Seattle and Vancouver, lies Orcas Island, the largest of the San Juan Islands in Washington State. 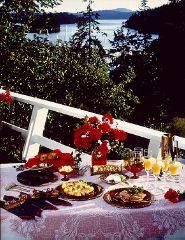 Here you will find Palmer's Chart House tucked away in scenic Deer Harbor. 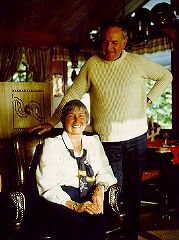 The Palmers welcome visitors with enthusiasm. "Because we're so water-oriented, we like to take guests sailing," Don says. They charge a minimal fee for island tours on their thirty-three foot private yacht. 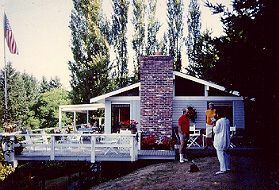 This was the first Bed and Breakfast on Orcas Island (since 1975). It features a quiet night's sleep and a gourmet breakfast. The atmosphere is informal. The well-travelled hosts speak Spanish. Orca whales are a major attraction. Tennis, swimming, golf, fishing, hiking, and biking are nearby. Personal checks are accepted; credit cards are not. Smoking is limited, as are the ages of children. Facilities are not available for pets or handicapped, Social drinking is allowed. Accommodations include two units with private baths: $60 sngl. occ. ; $80 dbl. occ. Spend a night and not a fortune.